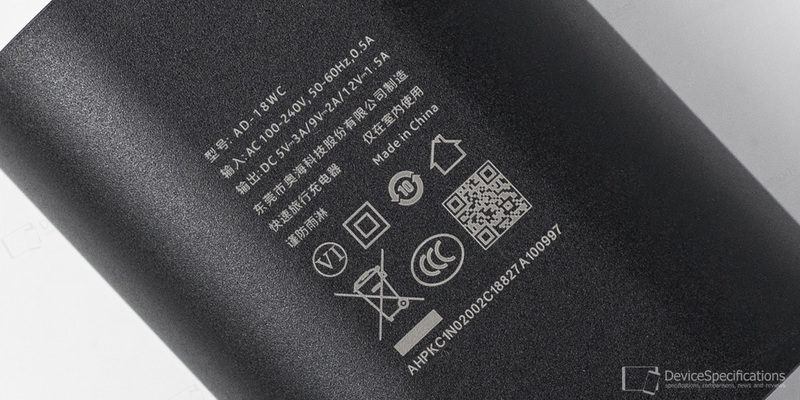 Nokia X7 features a 3500 mAh Li-Pol battery that's not removable and is paired with a 5V/3A~9V/2A~12V/1.5A fast charger (US plug). All battery tests we run on the devices we review are developed by us and performed with the screen of the device being calibrated to 200 cd/m2. Battery saving features are disabled. It took our review unit 1 hour and 43 minutes to charge from 0% to 100% with the provided USB Type-C cable and fast charger. The charging speed is snappy during the first 35 minutes after which the battery gains 50% of its capacity. After that, the speed drops down a bit and the next 40% need 38 minutes to charge. After that, the charging speed decreases significantly and the last 10% need 30 minutes. The battery temperature starts at 26°C and in 2 minutes soars to 40°C and begins to fluctuate dynamically from 40°C to 46°C during the next 1 hour and 8 minutes. After that, the battery temperature starts to decrease and in the end, it measures 29°C. Our review shows a browsing battery life of 9 hours and 6 minutes. The discharging process is relatively steady from the start until the end. The battery temperature starts at 27°C and in 1 hour and 9 minutes reaches 35°C. It remains at that level until the end with occasional drops to 34°C and jumps to 36°C. The video test for battery life uses a 1080p video at 30 fps with a ~20Mbps rate is used. Our review unit's score from this test is 11 hours and 4 minutes. The speed of discharging is relatively one and the same from the start until the end. The battery temperature starts at 28°C and in 40 minutes reaches 33°C maintaining this level for 4 hours and 31 minutes when it goes up to 34°C. This level is maintained until the end with occasional drops to 33°C. The 4K video battery life test uses a 2160p video at 30 fps with a ~55 Mbps rate. In this test, the battery of the Nokia X7 lasted for 10 hours and 17 minutes. The discharging pattern is the same as the one on the previous test. 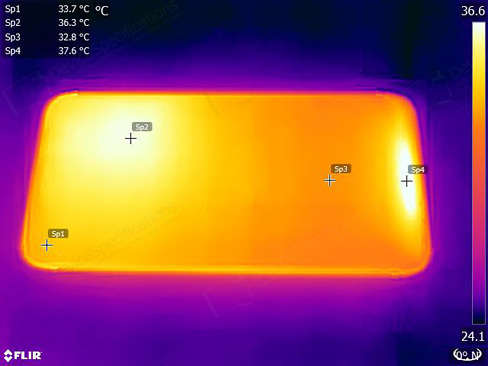 The battery temperature starts at 28°C, after 29 minutes it goes up to 33°C and maintains this level for 7 hours and 43 minutes, after which the temperature rises to 34°C remaining at this level until the end. For the 3D Graphics/Gaming test, the YEBIS OpenGL ES 3.0 3D Tech Demo is used. The battery of our review unit lasted for 7 hours. As the comparison chart below demonstrates, this result is execllent for a 3500 mAh battery and this test once again confirms our observations that this chipset is quite power-efficient even under heavy loads. The discharging process maintains a relatively steady speed from the start until the end. The battery temperature starts at 28°C and after 39 minutes jumps to 38°C. After 1 hour and 8 minutes, it drops to 37°C and after another 1 hour and 7 minutes, it drops to 36°C. The temperature maintains this level for 1 hour and 16 minutes, after which, goes up to 37°C and 1 hour and 4 minutes later, it goes up to 38°C. In another 24 minutes, the temperature increases again to 39°C and for the last two minutes, it goes up to 40°C. 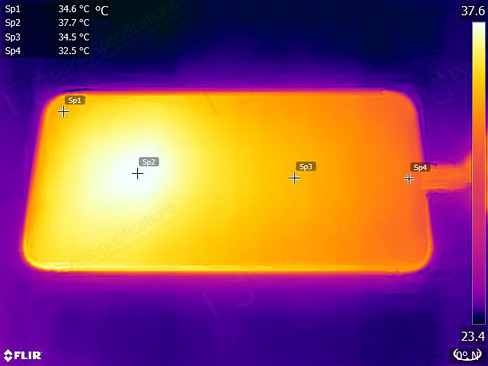 The above photos of our Nokia X7 review unit are taken with a FLIR thermal camera. The left photo shows the device's temperature during charging. In this case, the warmest part of the device is the top half centre with a temperature of 37.7°C. The second photo depicts the device's temperature during our 3D battery life test. This time, the hottest parts of the body are the top half area right off the centre with a temperature of 36.3°C and the centre of the chin with a temperature of 37.6°C. The Battery menu from the System Settings has been customized as well. It includes a Power saver, which can be toggled on/off at will and can be scheduled as well. A second feature is the Background activity manager, from where you can choose which apps should be saved from background clearing. The Battery Percentage toggle is there as well along with two features that can also be found under the Display menu - Sleep and Ambient display. The latter includes an always-on during charging option, lift to check phone on/off and new notifications on/off.